While I surely recommended inspecting the whole of the Shangri-La mixtape, I do want to highlight one track in particular: Wayne Jackson’s “It Happened In Tennessee.” I first caught wind of this track (Wayne’s sole vocal performance no less) through one of Oxford American’s southern music samplers. While the trials and tribulations of Sheriff Buford Pusser have been told, and retold, through throughout the years—both through song and the silver screen—(most recently on the Drive-By Truckers Dirty South LP), Wayne’s tale is up there with the best. The vocal clip of Pusser at the song’s tail end serves as the icing on the cake. 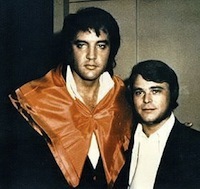 That’s Wayne, in Memphis, with the King. Pretty natty looking cape, too, no? Love this track. From the vinyl crackle to the back-ups to the section with the flutes… And what a great story. And yeah, that’s quite the cape. This track has a little bit of an Elvis feel, for sure. TOTALLY GREAT SONG! I found it on the same sampler and subsequently played it on my radio show ‘Deliverance’ on CJAM 99.1 FM in Windsor/Detroit. It’s so rare to come across sound textures like we have on this track especially something that’s not trying to be out there like Can or Zappa. Wonderful performances, cool song, what more can you ask for. The man himself has had, and still is having an incredible life, having performed on over 50 albums that made the number #1 slot on American Music charts with acts including Otis Redding, Sam and Dave, Aretha Franklin, Elvis Presley and Joan Baez even! It’s never gonna happen again so lap it up!